Gorgonzola vs Bleu Cheese which is better? Whats the difference between Gorgonzola and Bleu cheese ? If you have found yourself asking these questions at your local store then fear not as we spell out the differences in these two moldy marvels. Blue or bleu cheese whichever way you like, is a type of cheese that contains the mold Penicillium. It is the mold that gives it the blue marbled look that it is famous for. Gorgonzola cheese is a type of blue cheese that is produced in the Northern regions of Italy. That is essentially the difference between the two. In terms of production a Gorgonzola is always strictly made from whole cows milk. Whereas, bleu cheeses can also be made from goat’s milk. Both cheese use roughly the same manufacturing process although the Gorgonzola is a little stricter as to the exact process. Once the cheese curds have been formed into cheese wheels and left to rest for about a week it is time to form the blue veins that both cheeses are famous for. Thin metal sticks are inserted into the cheeses. The resulting airflow through the holes that remain allow the bacteria to form into mold. 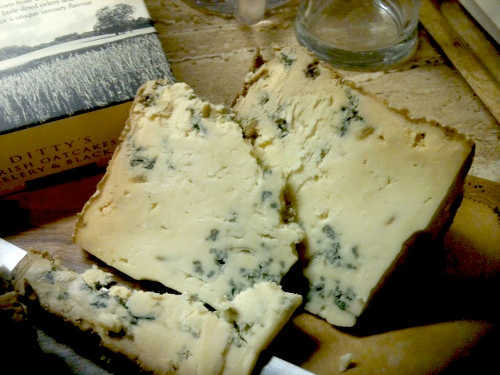 It is the mold that gives the distinctive blue/green veins that are found in the cheese. During the aging stage the cheese wheels must be rotated to ensure an even airflow over the outside of each wheel. Once sufficiently aged they are cut into sections and then packaged and ready to be sold. So as we can see they share a lot of similarities during production. However there are a few subtle differences in terms of flavor, smell and texture. Bleu cheese tends to have a sharper more acidic and generally saltier taste than Gorgonzola. With Gorgonzola however there are two main types; Gorgonzola Dolce which is the younger and slightly milder cheese. It is usually aged for about three months and then consumed. The older variety Piccante(sometimes called Montagne or Naturale) has a much stronger more mature taste and also a much more pungent aroma. For the most part just like in the flavor department Blue cheeses will have a stronger smell than a Gorgonzola. However, it does depend on the variety as there are some milder blue cheeses available for those that do not like the stronger more traditional ones such as Roquefort or Stilton. Generally speaking the crumbliest cheese will probably be a bleu cheese. Although a well aged Gorgonzola will become quite crumbly as it starts to slowly dry out. There are even bleu cheeses available that are specifically best suited to being crumbled over a dish. This crumbly structure can make them difficult to cut. There are a number of different varieties available from different countries. Irish Cashel Blue, Danish Blue, French Roquefort, Maytag, English Stilton and of course the both the Italian Gorgonzola’s Dolce and Piccante. If you are trying to find a favorite then one of the best ways would be ask your local cheese-monger for a sample of each. As with any food you should always start with the weakest first. That way you can work your way up through the stronger flavors without the lesser ones affecting them .If you start with the strongest then it will always over power the weaker ones and you will not really taste any of the more subtle flavors associated with them. Well there you have Gorgonzola vs Bleu Cheese hopefully we have cleared up any questions you had! « Baking Powder Substitute – What to Use? The Kitchen Revival is a participant in the Amazon Services LLC Associates Program, an affiliate advertising program designed to provide a means for sites to earn advertising fees by advertising and linking to Amazon.